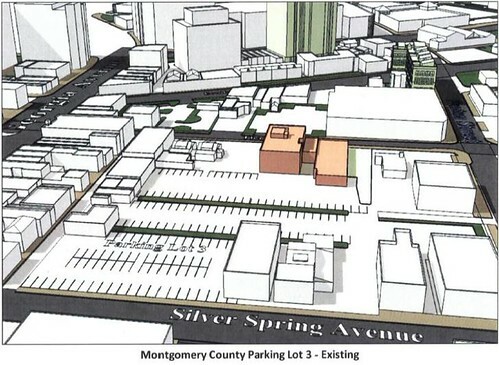 The Silver Spring CBD Green Space Plan, proposed by the Planning Department, seeks to create more parks Downtown. 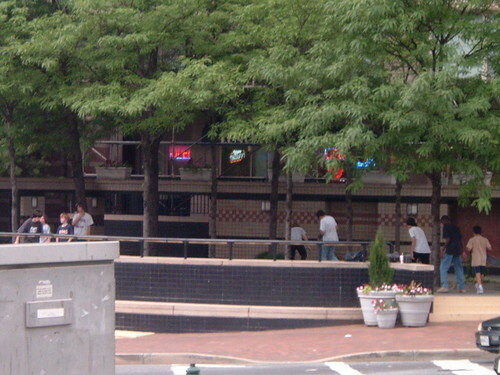 LEFT: Skater kids show their stuff in a "pocket park" at Colesville Road and East-West Highway in 2005. In recent decades, Park and Planning's answer to increased density in Downtown Silver Spring has been the so-called "pocket park." A requirement for most new developments downtown, these little patches of green were intended to give people a place to play and green up the city streets. However, they've done little of either. As many Downtown residents and visitors can point out, most "pocket parks" have become the province of homeless people or skater kids - or, worse yet, abandoned altogether. 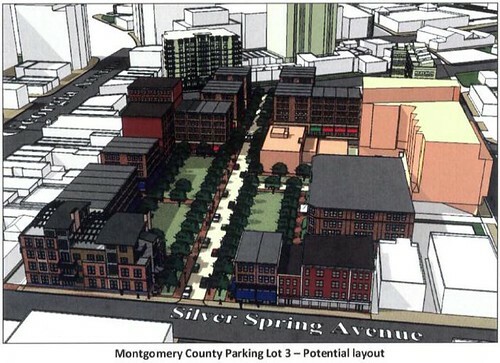 Enter the Silver Spring CBD Green Space Plan (warning! PDF file), set for review by the Planning Board next Thursday. Taking cues from some of the world's great urban spaces - from Square Saint-Louis in Montreal to Market Square in Alexandria, the plan seeks to create a livelier and healthier Downtown through its open space. Its main goals are to clean up existing spaces that don't work, like Discovery Place on Wayne Avenue, a former "pocket park" that was fenced off and no longer feels like the public space it is. 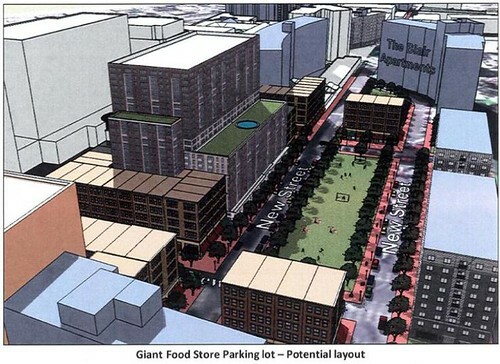 The plan also seeks to create new, larger urban spaces over existing County-owned parking lots. (Parking would be replaced underground.) Some of the proposals envisioned aren't just parks - they redevelop entire blocks, producing new opportunities for housing and business and raising the bar for Silver Spring's redevelopment. AFTER THE JUMP: What kind of new green spaces and infill development could South Silver Spring, Fenton Village and the Blairs see in the coming decades? 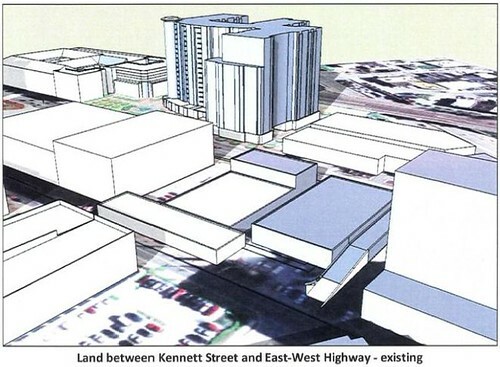 A possible square in place of the current Kennett Street Parking Lot in South Silver Spring. 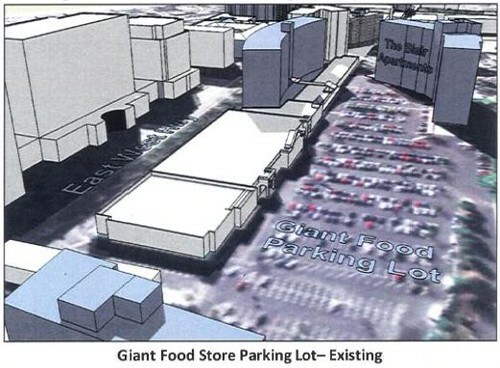 How County Parking Lot 3 could be redeveloped. Silver Spring Avenue is at the bottom and Bonifant Street is at the top. 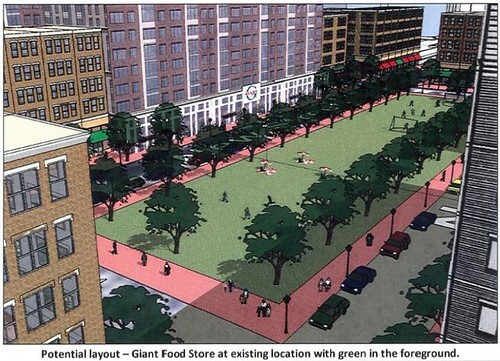 The parking lot of the Blair Park Shopping Center re-envisioned as a sprawling green. Note that the Blair East and Blair Plaza apartment buildings have been preserved, while the Giant becomes the base of a high-rise. Taxpayers need to be very, very watchful that these 'green spaces' are publicly-owned amenities, not privately owned. 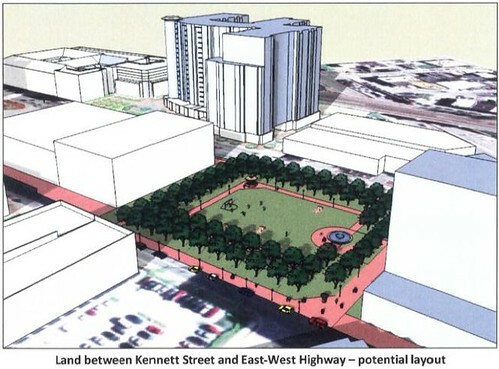 If you watch the recent Planning Board approvals and look at many current development proposals, the county is now putting in place a de facto planning policy, turning what we assume to be public spaces (e.g., parks, streets) into privately-held property. The county is privileging privately-owned, publicly 'accessible' amenities over our first amendment rights. Hey, if you turn all "public" space into a sort of giant shopping mall, then you can tax the "public" space directly instead of taxing the general public, right? Sorry, I think my "irony switch" is turned to the "full on" position. Isn't lumping skaters in the same category as the homeless a little 1985? Skating is a good alternative to getting into trouble, no? Absolutely. I fully support skating as a means of recreation and looking super awesome. When I used to work in Bethesda, I'd have to switch buses in Silver Spring on my way home, and waiting up in the terrace next to the bus turnaround I'd see homeless people napping and skater kids doing tricks on the concrete planters. You see the same things in front of Lenox Park or in any little sliver of open space Downtown. It's not lumping them together. They coincide - for their own reasons, of course. Homeless people need a place to chill without getting hassled. Skater kids need a place to skate without getting hassled. That being said, though, I think we could do better than our current "pocket parks" - hence the post.